In the past it was never easy to classify Akroma’s music. Describing the French band’s style as extreme metal would come closest, and makes also sense for their third album La Cène. Like on their previous two albums, they once again use Biblical motifs, even though it would be farfetched to call the band religious. After the seven mortal sins (Sept) and the ten Egyptian plagues (Seth), the topic this time is the Last Supper and the twelve apostles. As expected, the band starts out with symphonic bombast on the first track Pierre. The vocalist exemplarily masters the high registers and adds a hysterical touch. Akroma have been known for their many mood changes since the beginning. Instead of only delivering blast beat attacks, there is also time for quieter parts, grand choirs and additional soprano vocals. These elements bestow the music a morbid undertone that reminds me of Celtic Frost’s Into The Pandemonium era. 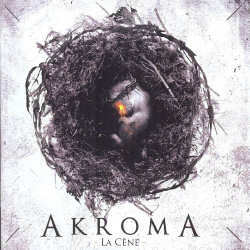 Akroma manage to keep a constantly high level throughout the really generous running time of the album, without ever stumbling over the technical complex structures. La Cène is great from beginning to end, and therefore it is hard to pick out favourites, but I still decide to single out some tracks that are even a little more special. Barthelemy is a tumultuous piece with wonderful female backing vocals arrangements that remind me of Amon Düül II. Jude has all it takes to become a black metal hymn, and Philippe could even appeal to Nightwish fans. Jean is somewhat quieter, more melancholic than the remaining material, and the concluding Judas turns out to be the band’s most complex song yet. The CD booklet is also aesthetically appealing, but it takes a magnifying glass to decipher the tiny font size of the lyrics. La Cène might be a little more straightforward than the preceding albums, and makes access for new fans consequently easier. But still it would be wrong to expect easy listening from Akroma. Every little detail has been thoroughly planned, and such demanding music wouldn’t work otherwise. Therefore I am ok with the band’s long breaks between albums, if this means that they top themselves with every new release. Therefore this record deserves the highest rating.